Have You ever put off important tasks? Most of us have. Do you do that quite often? Chances are you are a victim of “The Big P” — Procrastination. 1 in every 2 people say procrastination has a negative effect on their happiness, reveals an online survey by the Procrastination Research group at Carleton University. 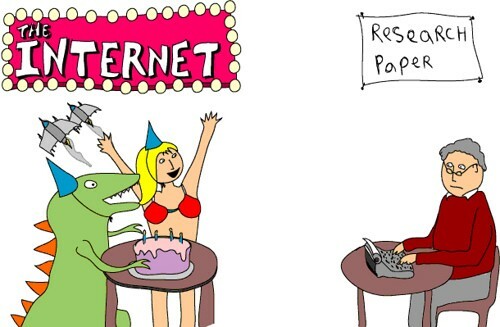 Procrastination is a growing problem today. 26% of people were chronic procrastinators as of 2007, compared to just 5% in 1978 says a study in the Psychological Bulletin by Piers Steel. Apart from losing your job and ruining your relationships, procrastination can get you physically sick. How many times have you heard “Just do it.” That just doesn’t work, does it? The real answer to overcoming procrastination lies in a deeper look at why you procrastinate. This guide outlines a data backed list of methods to overcome procrastination. To make the best of this post, go through the why you procrastinate section. You can then pick some of the easy and effective methods from the list to start overcoming procrastination. However, Putting a task off due to rational reasons is not Procrastination. It can actually be quite productive. Dr. Joseph Ferrari has identified 3 Types of Procrastinators. Figure out what type you are, use the following flowchart from Dr. Ferrari. Our Mind will always move us towards Pleasure and away from Pain. Sometimes not doing what you’re supposed to be doing gives the brain a higher sense of reward. Think about a pending task you have. Chances are you won’t like the feeling of it. When the reward of completing the task is not enticing enough and near enough, your mind will generate the good feeling without having to work through the task. Here are three external reasons that cause procrastination. Fear: High Fear of Failure Predicts more Procrastination. Fear is a full body experience. However your brain does most of the controlling. Emily Fletcher, an expert on Ziva meditation, says fear is good for you, only when you are being attacked by a bear. Research shows fear is bad for Productivity and Competence is good for it. Analysis Paralysis: Have you ever found yourself overloaded with information? So overwhelmed you have no idea how to make any sense of it? That’s analysis paralysis in action. Analysis Paralysis is over analyzing something and not taking action on it. Visualizing the outcome and determining small baby steps will help you curb analysis paralysis. Distractions: You’re brain will generate and use distractions to get away from the discomfort of getting something done. While in the short term this may be beneficiary, In the long run there are several negative effects of distraction. Email: A typical information worker checks email more than 50 times a day, according to RescueTime.That’s once every 9.6 minutes. Limit Email Checking to once or twice a day. Social Media: Ever lost yourself going through Youtube, Facebook or Twitter?These platforms are designed to keep you hooked. So hooked you form habits out of them.Pre-Schedule an hour or two everyday towards the end where you check on these websites.This will help you limit your social consumption. Environment: Setting up a positive work environment is critical to achieving the flow state.Factors in your environment like lighting or loud colleagues may also serve as a distraction. Get more distractions out of the way with these two tools. Leechblock(Firefox)/StayFocusd(Chrome): Limit your email and social consumption during a set period everyday with this website blocking service. It even suggests which websites you should be blocking. Rescue Time: This time tracking app will track your computer usage, and send you weekly emails on how much time you spent on work and entertainment. The goal need not be to increase work and decrease entertainment. The goal is to keep a track of how much time you spend on productive work. Now that we know why we procrastinate, we have a vague idea on how to Stop Procrastinating. Here are concrete steps you can take to get rid of Procrastination. Want to be more productive? Focus on becoming Happy. “The single greatest advantage in a modern economy is a happy and engaged workforce. A decade of research proves that happiness raises every business and educational outcome: raising sales by 37%, productivity by 31%” — Professor Shawn Achor, Author of The Happiness Advantage. Here are a few fun science backed ways of becoming more Happy. Send a quick 2-minute email to a colleague, teammate, friend or a family member telling them how much you appreciate them and why your grateful for them. This is why I often ask managers to write an e-mail of praise or thanks to a friend, family member, or colleague each morning before they start their day’s work — not just because it contributes to their own happiness, but because it very literally cements a relationship. 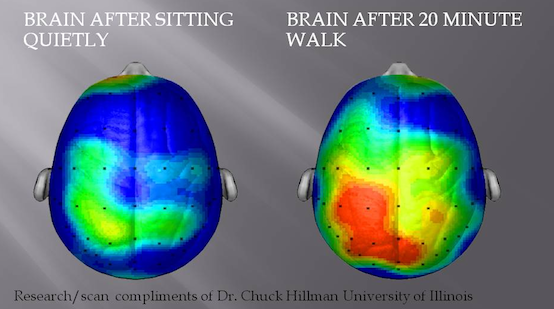 Exercise helps you generate energy over a very short time frame. Your body uses a chemical called ATP for energy. These are produced by mitochondria in your cells. Exercise helps increase the number of mitochondria in your cells. Exercise also helps you boost happiness. When you exercise, you’re body feels under stress. It then releases endorphins and BDNF, which calm you down and help you reset memory neurons. BDNF is a mood enhancer. And get this. It is as addictive as nicotine and cocaine. And its good for you! You don’t have to spend over an hour at the gym. Unless you want to. You can just go for a 20 Minute Walk. 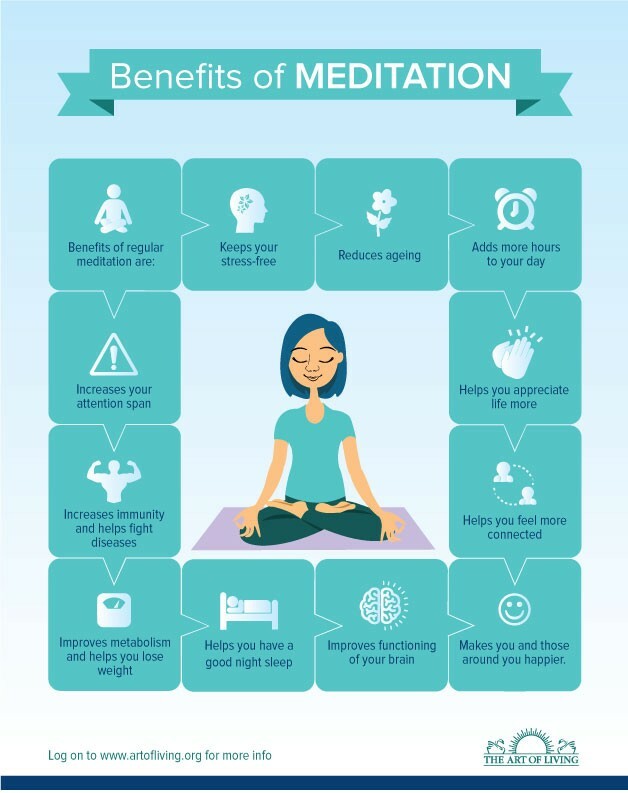 Let’s take a look at what meditation can do for you. Increases Immune Function and decreases pain. Boosts Happiness by increasing Positive emotion and decreasing depression, anxiety and stress. Helps you become more emotionally intelligent and compassionate. It even helps you overcome lonliness. It helps increase grey matter, and volume of areas related to emotion regulation and self control in the brain. And above all, increases focus and attention while you do absolutely nothing. If you are starting out it can be a little annoying. We recommend the free meditations at Calm.com to make it more easy on you. Have a fixed routine for meditation. Same time everyday at the same spot. This will help you reinforce the habit. Kissing has more benefits than you could think of. .. It also releases your happy hormones. Kissing helps your brain releases a magical elixir of dopamin, serotonin, oxytocin(the love hormone). After decades of avoiding the subject, scientists are finally figuring out that sunlight is actually really good for you. Lack of exposure to the suns rays has been linked with, fertility problems, several forms of cancer, degrees of depression. Sunlight helps boost serotonin levels in human beings. Serotonin is one of the happiness neurochemicals. It helps improve confidence. This is why moods are elevated during summer, and suicide rates higher during winters. For higher serotonin levels, you can’t just do with the lights at home. You need the sun’s rays. But you don’t want too much of it. The Ultraviolet Rays from the sun are still harmful for you. Aside from the career benefits, can Volunteering increase Happiness? Adam Grant, author of Give and Take: Why helping others Drives our Success, tells us about a study of over 2000 Australian adults. According to the study, people who volunteered for 2 hours a week(100 hours a year), were happier and satisfied with their life than those who volunteered fewer than 100 hours. We know, Happiness leads to smiling. Did you know that smiling also leads to happiness? This is called embodied cognition. The Human Body is like the Bat Mobile. 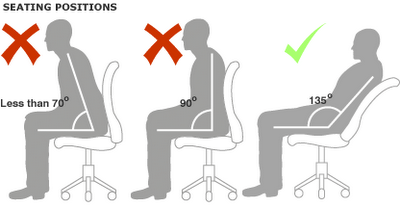 For example, if you just sit comfortably upright, you’re going to associate positive memories with the present moment. If you face your palms upwards you’ll notice your breathing different than when your palms are facing downwards. Standing Tall can literally make you more powerful and affects you’re decision making and leadership capabilities. 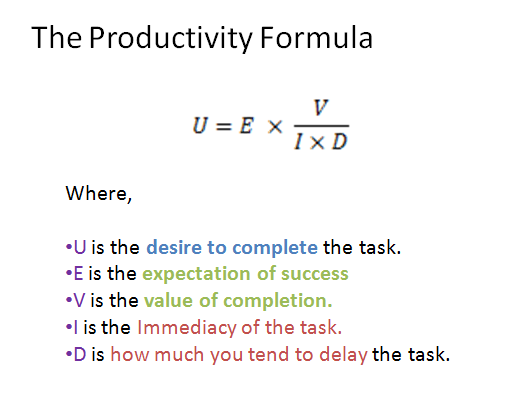 Researchers have devised a formula for productivity. The formula is used to calculate just how much desire you have to complete the task. Don’t bother placing actual numbers. The formula dictates the factors you need to focus on. All you have to do is increase the following. The Expectation of succeeding at the Task: Visualizing the given task will help you increase this. The Value of Completing the Task to You: Set up stakes. Announce your objective to your social network. And follow up with the results. An amazing example of this : Bryan harris of Video Fruit recorded himself creating his course on Youtube, giving 1$ to anyone who catches him slacking off. Delay in getting the task Done: Make the task easy to start.Want to head to the gym or go for a run first thing in the morning? Go to sleep in your gym clothes. The Immediacy of completing the task: Plan tasks a week ahead and fill up your calendar. When you’re in the state of Flow you are working to master the activity at hand. You need to constantly apply higher challenges. Flow boosts performance. It has also been known to boost persistence and achievement while simultaneously reducing anxiety and raising self esteem. How do you stimulate the flow state? In 2013, Dr. Schaffer, proposed 7 conditions to flow. Looks like Jim Rohn was right. Among many athletes, Mixed Martial Arts Champion, Lyoto Machida, uses meditation to achieve a state of Flow. There are three conditions required to encourage Flow in the Work Place. So how do you set yourself up for Flow next time you set to do a particular task? What is going to distract me and how am I going to stop it? How do I know how well I’m doing it? What are the Challenges in this task that excite me? What skills of mine will allow me to Get this Done? Or If you do not have the skills how do you find skill how will you get those skills from this task? #4 Plan Your Week Backwards. Why plan the entire week? Planning your entire week will allow you to have a clearer picture of where you are going. This is why its important to sit down on a fixed day at a fixed time every week and write out everything that will help you reach your goal. How do you plan the week? Once you have important and urgent tasks out on your list, Plan your week backwards. Start by planning your weekends and then move back into Monday. You’ll notice you’ll keep your weekends free. A study from Stanford shows that productivity per hour declines at an alarming rate when workweek extends beyond 50 hours. People who work as much as 70 hours actually get the same amount done as people who work 55 hours. You can use a simple systems like Google Calendar, ICal, or Proud to map out your tasks and the days you will allocate to them. You’ll notice you’ll find lots of free time. And next time your friends call you, you’ll find time for them. #5 Use 3 Daily Lists to Make Work Easier. While planning your entire week is important, planning your day is critical.This is the constant feedback system, required for the Flow state. Here are 3 tips to make the most of your todo lists. Write your todo lists backwards. Write them in Active voice. Scratch out unnecessary tasks. Make more time for Doing Nothing. Doing more is not being Productive. Intelligently doing less is. Have a list of things you are Not Going To Do Today. These include things you shouldn’t do today. If we don’t have this list, Your mind will bring these up in the background of your work. Buffer founder, Joel Gascoigne keeps an Anti-Todo List everyday, leaving his mind free to do more important things. Once something goes in there, you don’t have to worry about it today. It can be delegated to the next day. The age old advice never fails. Keeping a done list will help you gain confidence and increase your productive momentum. Since nearly half of what you do everyday are automated mental processes, doesn’t it make sense to have the right habits in place? Habits are designed to save your brain some energy. This will allow it to invest more attention on tasks that matter. The Ritual you setup will be very personal to you. A universal system might not work for everyone. Keep it simple and focus on achieving daily goals. Australian Psychologist, Alan Richardson once conducted an experiment.He took a group of basketball players and divided them into three groups. The objective of the experiment was to test their abilities to make free throws. The first group would practice for 20 minutes everyday. The second group would only visualize themselves making the free-throws, and no real practice was allowed. The third would neither practice nor visualize. There was significant improvement in the group that only visualized. They were almost as good as the group that practiced. A study found that building Castles in the sky sabotages your chances of achieving your goal. A study from UCLA found that the mistake is in what we visualize. Visualizing the process of doing the work will help you reach your end goals. Visualizing the end goal will ruin your chances of getting there. You don’t necessarily need to close your eyes and dream up the work. If you get the worst thing on your todo list right in the morning, the rest of your day becomes cake walk. 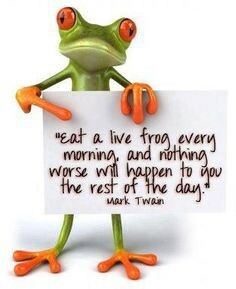 This is the principle behind Brian Tracy’s classic book- Eat that Frog. Did you know that you’re the most chilled out right in the morning? You have more will power right in the morning. Its during the evening that sticking by becomes difficult. This is why you should start with the most important work right in the morning. You’re more likely to get it done. Power CEO’s take this to a whole new level. They wake up early. And they’ve already done the most important task before breakfast. This way while the whole world just begins working, These guys are already ahead. By the way, make sure you don’t skip on sleep. To perform optimally, rest is critical. So don’t ditch the bed. Embrace it for as long as you actually need. Now you know why you Procrastinate. Every single one of these steps use the science of Procrastination to your Advantage. Applying this will help you lower stress and increase performance, achievement and happiness. To make the best of this post, jot down a list of a methods you are going to work on to increase productivity. Don’t hasitate to share with us your methods how to stop procrastinating! Reach as at @UseProud.